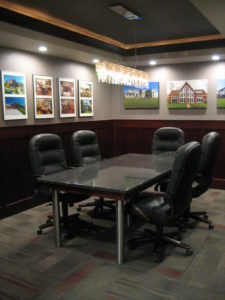 We had the opportunity to assist Kochmann Brother’s Homes with the remodel of their showroom and office space. Everything from flooring to cabinet hardware and lighting was selected for them. Whether you’re looking to build or remodel your home, Kochmann’s is a great place to go! The conference room is the perfect place to meet with Kochmann Brother’s Homes to discuss your new home or remodel project. Cherry wainscoting adds warmth and beauty while providing protection to the lower portion of the walls. A textured wallcovering in a neutral color allows for their homes to stand out and act as the artwork in this space. Carpet tiles in red, gray, and black perfectly compliment their logo and tie their entire showroom together.